I can't speak for the Rev 8's however I have a XM9 powered with a Harpoon setup with another set of tower surf speakers powred seperatley and they ROCK. Love the way they sound. Good from the line and sounds great when just sitting listening. I say XM9s, Have them and have heard both. Also you can rotate two on each side with out disconnecting one. Most people compare the XM9s to the Rev10s I don't know if I have ever heard them compared to the rev 8s but it will be interesting to see what the wetsound fans say. Do you ever have problems with the speakers spinning on the mount after cruising though rough waters? Never any problems for me. It is a nice setup you can tighten with a allen wrench not sure if it is the same with the rev8s but someone will let you know. Right on. The revs permanently mounted and can not be spun around like the xm9 so no worries about them moving. You can but a kit for the revs for like 50-75$. If you end up liking the rev8s better. I wouldn't look at the swiveling as a bad thing never heard anyone say they had a problem with it. 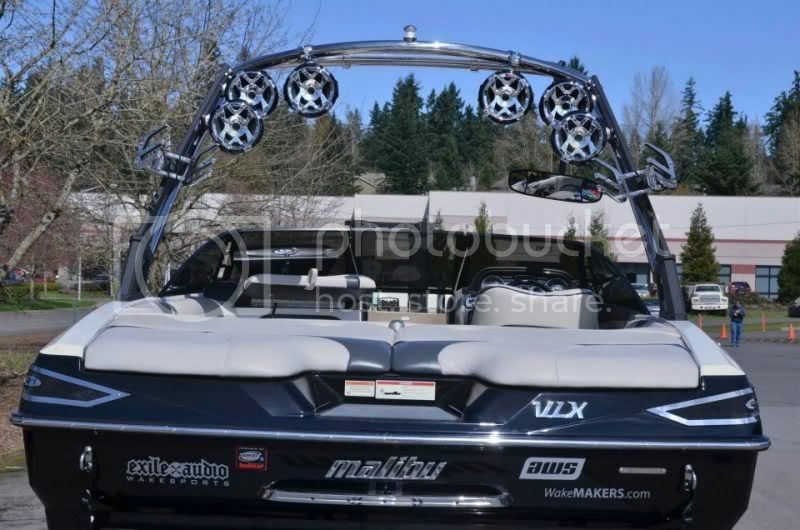 For most it is a must so you can angle them up a little to keep the sound down some in the boat. I did not know you could do that for the revs. Thanks for the input. Before this post I was leaning towards the revs, now maybe the other way. I guess I will wait for a few wet sounds guys to chime in. I have heard both and the XM9's have a warmer mid base, sound to me, they hit really hard and you can feel that from a distance, The rev 8's sounded good I just prefer the sound of the 9's Also love the quick release mounts, had to pull them off a few times to dodge a Thunder storm, Took less the 5 minutes and I have 6 of them, I have had this kinda of mounts for over 15 years, Never had a problem at all.. The best advice is to listen to both and maybe a few other systems and decide for yourself. Chevy is better than Ford hands down now what do you what to drive. Truekaotik as I said before people compare the Rev10s to the XM9s. Are you saying the rev8s are comparable too or are you just a wet sound fan. Bradley - I am going to politely disagree with you on your statement. A 6.5" performs differently than an 8" and an 8" performs differently than a 10" It is not accurate to compare a 8" speaker to a 10" speaker. Same concept applied to a 12" woofer versus a 15" woofer. It would be like comparing a queen size bed to a king size size bed, a short bed truck to a long bed truck or a minivan to a full size van. Please don't turn this into a "Murphy is a fan of WS". Bradly.. I disagree and it shows who's brainwashed buddy... I don't know where you get "people" compare the xm9 to a rev10 but from exile guys... Did you know the xm9 is a 8" driver? Before I start getting bashed again by fanboys, please read up on product... That's just a start to the VAST differences in tech.... Not trying to offend anyone but atleast know the products.. I was just poking for fun and it worked. The Model-X and Model-Y are both an 8" HLCD driver. Model-Z is a 10" HLCD driver. Would you compare an F150 gaser to a Chevy 2500 Duramax in towing performance? I can line up a dozen 10" woofers from various companies and measure their diameter in the same fashion and there will be some slight differences. But at the end of the day, they are ALL in the 10" sub-woofer class. So if ones 8" HLCD is slightly larger then 8", by lets say .375", its still in the 8" group. It would not be a fair comparison to compare it to the larger 10". Well thanks to all of the .02 replies. That is what I asked for. Should let you all know that I decided on two pair of the exile sxt65 with harpoon amp and the zone controller. After talking with Brian from exile I decided this was the best option for me. Because I am not on a huge lake and don't want to piss off the neighbors too bad, I thought the quality of the surf speakers is better when sipping on cocktails in the boat which is what happens 50% of the time and the other is split between wake boarding and surfing. I figured I don't need the projection of the horns....yet! Nothing like a good old fashion informed decision. he did his homework and found something that works for him, and decided. I have heard many systems, been doing this along time, WS Makes great stuff, Exile Makes great stuff, I can go on and on, The best advice was given, Ask for peoples opinions, which I found very helpful in narrowing it down, Then if Possible take a listen, Last year I heard a full WS Boat Go By, and it sounded awesome, Then at the dock the guy came up to me and just raved about my Exile system, 2 Quality company's that gives us lots of choices, And good competition just means better products for all of us to choose from!! Posts like this is what caused issues in the stereo form some time ago, easy does it with the strong brand opinions man and as you said no one here can make your decision so why do you have to tell the guy brand x is far superior to brand y then? But being a newer member to the crew perhaps you dont know the challenges that we faced. Centurion guy spreading the WS love. I believe the quality is in the tune with a Oscilloscope. I have 3 pairs of rev 10's on an illusion x tower and you can forget about head room. Both ws and exile are great speakers but one has more chrome on the grill than the other. I have the Rev8 on my boat. Great sound, no problems with the headroom, and well mounted. I think you will be happy with either set-up. One Rev10 for every dog that you have pictured in your Avator. Are those all you dog's? That takes one strong vaccum cleaner!